For other uses, see Abbottabad (disambiguation). Abbottabad (/ˈæbətəbæd/ or /ˈɑːbtəbæd/) (Urdu, Hindko: ایبٹ آباد‎ Aibṭ ābād [ɛːbʈaːˈbaːd]) is the capital city of Abbottabad District in the Hazara region of eastern Khyber Pakhtunkhwa, Pakistan. 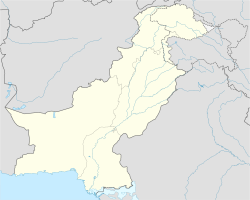 It is about 120 kilometres (75 mi) north of Islamabad and Rawalpindi, and 150 kilometres (93 mi) east of Peshawar, at an altitude of 1,260 metres (4,134 ft). Kashmir lies to the east. Abbottabad was founded and named after Major James Abbott in January 1853 as the headquarters of Hazara District during the British Raj after the annexation of Punjab. He remained the first Deputy Commissioner of the Hazara district from 1849 until April 1853. Major Abbott is noted for having written a poem titled "Abbottabad", before his return to Britain, in which he wrote of his fondness for the town and his sadness at having to leave it. In the early 20th century, Abbottabad became an important military cantonment and sanatorium, serving as the headquarters of a brigade in the Second Division of the Northern Army Corps. The garrison consisted of four battalions of native infantry, of the Frontier Force (including the 5th Gurkha Rifles) and two native mountain batteries. 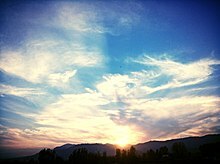 A sunset scene in Abbottabad. In 1901, the population of the town and cantonment was 7,764 with an average income of Rs. 14,900. This increased to Rs. 22,300 in 1903, chiefly derived from octroi. During this time chief public institutions were built such as the Albert Victor Unaided Anglo-Vernacular High School, the Municipal Anglo-Vernacular High School and the government dispensary. In 1911, the population had risen to 11,506 and the town contained four battalions of Gurkhas. In June 1948, the British Red Cross opened a hospital in Abbottabad to deal with thousands of injured being brought in from Kashmir. In October 2005 Abbottabad was devastated by the Kashmir earthquake. Although most of Abbottabad survived, many older buildings were destroyed or severely damaged. On 25 January 2011, Indonesian terrorist Umar Patek was arrested in Abbotobad. Patek, a member of the Jemaah Islamiyah terrorist group, was wanted in connection with a deadly series of church bombings in Indonesia in 2000, and three attacks that killed 202 people in tourist districts of Indonesia in what became known as the Bali bombings. On 2 May 2011, Abbottabad gained worldwide attention when U.S. President Barack Obama announced that Osama bin Laden had been killed in his compound in the city. In February 2012, nine months after bin Laden was killed, Pakistani authorities demolished the compound where Osama bin Laden had lived for years. Abbottabad is in the Orash Valley lying between 34°92′N latitude and 73°13′E longitude at an altitude of 4,120 feet (1,260 m). To the north is the picturesque Kaghan Valley. Abbottabad has a humid subtropical climate, with mild to warm temperatures during the spring and autumn months, hot temperatures during June and July, and cool to mild temperatures during the winter. The temperature can rise as high as 38 °C (100 °F) during the mid-summer months and drop below −5 °C (23 °F) during the extreme cold waves. Snowfall occurs occasionally in December and January, though it is sparse, while heavy rainfall occurs during the monsoon season stretching from July to September that frequently cause flooding in lower lying parts of the city. Abbottabad has been attracting tourists to the city since the colonial era, as it is a major transit point to all major tourist regions of Pakistan such as Nathiagali, Ayubia and Naran. According to the Imperial Gazetteer of India, "the town is picturesquely situated at the southern corner of the Rash (Orash) plain, 4,120 feet (1,260 m) above the sea". The Karakoram Highway, which traces one of the paths of the ancient Silk Road, starts from Hasan Abdal on the N5 and heads north passing through the city, eventually reaching Khunjerab Pass. The Karakorum Highway is a major attraction itself for its views. The Karakoram, Himalayas and the Hindu Kush ranges can be approached from Abbottabad, and it continues to be a transit city for tourists, serving as a base for visiting nearby places, such as Hunza, Gilgit, Skardu and Indus Kohistan, of the Karakoram Range. There was an influx of migrants from Azad Kashmir after the 2005 Kashmir earthquake, another from the Swat District during military operations against militants in 2009 and 2010, and from Waziristan after the army launched major operations against the Taliban in 2009. There is an under construction £19m amusement park in the city on a 50-acre site is includes a zoo, adventure sports facilities, restaurants and artificial waterfalls. 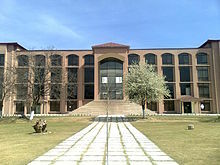 COMSATS Institute of Information Technology. Abbottabad has one of the country's highest literacy rates with 67% in 2007, and 87% in 2011 ranking first in Khyber Pakhtunkhwa and second overall in Pakistan. The city has a young demographic (ages 15–30) due to the large number of students who have come from across the country to study in its schools, for example PIPS, Army Burn Hall College, Army Public College and Abbottabad Public School. The city has a wide variety of post-secondary institutions, such as Ayub Medical College, Frontier Medical College, COMSATS University of Science and Technology, and the University of Engineering & Technology. Abbottabad is home to the Pakistan Military Academy, a four-year coeducational federal service military academy that provides training to the officers of the Pakistan Army. The academy has three training battalions and 12 companies. Another 2,000 guests each year, from over 34 countries, receive some training at PMA. Electronic and Print media is actively playing its role in Abbottabad. Cable Net Hazara is the largest cable operators of the region providing Pakistani channels to the masses. Kay 2 TV is the Hindko channel of the area. There are daily newspapers published in Abbottabad. Some of the newspapers are Roznama AAJ, Roznama Shamal, Kay 2 Times, Roznama Pine, Weekly Manzar and the Hindko newspaper Chaita. The Daily Mahasib, published since 1997, is a local newspaper. Abbottabad's main public transport consists of modified taxis. Abbottabad is also served by Daewoo Express and Niazi Express, the NATCO, Skyways and other bus services. The nearest railway station is in Havelian, which is the last and most northern station on the Pakistan Railway network. The station is approximately thirty minutes drive south from Abbottabad city centre. ^ "POPULATION AND HOUSEHOLD DETAIL FROM BLOCK TO DISTRICT LEVEL: KHYBER PAKHTUNKHWA (ABBOTTABAD DISTRICT)" (PDF). Pakistan Bureau of Statistics. 3 January 2018. Retrieved 17 April 2018. ^ "URL accessed 5 April 2006". Nrb.gov.pk. 28 October 2005. Archived from the original on 15 April 2012. Retrieved 28 January 2012. ^ a b "Abbottabad". Encyclopædia Britannica. I: A-Ak - Bayes (15th ed.). Chicago, Illinois: Encyclopædia Britannica, Inc. 2010. p. 13. ISBN 978-1-59339-837-8. ^ a b c "Abbottabad Town – Imperial Gazetteer of India, v. 5, p. 1". Dsal.uchicago.edu. Archived from the original on 7 June 2011. Retrieved 2 May 2011. ^ "The Project Gutenberg eBook, The Panjab, North-West Frontier Province, and Kashmir, by Sir James McCrone Douie". Gutenberg.org. Retrieved 2 May 2011. ^ "Partition of India and Pakistan 1947 – British Red Cross". Redcross.org.uk. Archived from the original on 21 March 2012. Retrieved 2 May 2011. ^ "Doctor's diary". BBC News. 14 October 2005. Retrieved 2 May 2011. ^ "Bali bombing suspect Umar Patek 'arrested in Pakistan'". BBC News online. 30 September 2011. Retrieved 30 September 2011. ^ "Militant's road ends in Pakistan". Dawn. 15 April 2011. Retrieved 4 May 2011. ^ L. Meckler, A. Entous and Z. Hussain (1 May 2011). "U.S. Forces Kill Osama bin Laden Obama Says Sept. 11 Attacks Avenged in Commando Assault on Pakistani Compound; Body of Terror Mastermind Captured". The Wall Street Journal. ^ Adams, Richard; Walsh, Declan; MacAskill, Ewen (2 May 2011). "Osama bin Laden is dead, Obama announces". The Guardian. UK. Archived from the original on 2 May 2011. Retrieved 2 May 2011. ^ Gordts, Eline (27 February 2012). "Osama Bin Laden's House In Abbottabad Destroyed". Huffington Post. Retrieved 27 February 2012. ^ Meredith Melnick (4 May 2011). "Abbottabad, a Hotspot for Medical Care". Time. ^ "Climate: Abbottabad - Climate-Data.org". Retrieved 19 January 2019. ^ "sdnpk.org". sdnpk.org. Archived from the original on 21 January 2009. ^ "Hopes for bumper tourist season in Abbottabad". Dawn.Com. AFP. 15 May 2011. Retrieved 28 January 2012. ^ "Bin Laden Town Abbottabad Plans Theme Park". Sky News. ^ "Pakistan Military Academy – Cadets Training". Pakistanarmy.gov.pk. 25 January 1948. Retrieved 3 May 2011. ^ "Alif Ailaan Pakistan District Education Rankings, 2014" (PDF). Alif Ailaan. Retrieved 6 May 2014. ^ "Individual district profile link, 2014" (PDF). Alif Ailaan. Retrieved 6 May 2014. ^ "Daily Mahasib Edition Online E-Paper". mahasib.com.pk. Wikisource has the text of the 1911 Encyclopædia Britannica article Abbottabad. Wikivoyage has a travel guide for Abbottabad. This page was last edited on 25 April 2019, at 23:44 (UTC).